Bertha, the boring machine that has been making its very, very slow journey under Seattle’s streets, is about to pass under the structure all this work has been designed to replace. The viaduct, a double-decker raised structure that runs along Seattle’s waterfront, carries roughly 100,000 vehicles into and out of the city’s central core every day. All those travelers—commuters, tourists, and residents—will have to find alternate routes during the closure. Even minor setbacks, such as the crab truck that overturned on the viaduct last week, can slow traffic to a crawl throughout downtown Seattle. A two week closure of the viaduct will radically reshape the daily commutes of hundreds of thousands of locals. The viaduct will be closed for an estimated two weeks from South Spokane Street to the Battery Street Tunnel as Bertha passes beneath the fragile structure. In January of this year, a sinkhole opened in the soil near where Bertha was drilling. Officials still do not know the exact dates of the closure; Bertha’s progress through the city has been plagued with delays, making the exact date that the boring machine will reach its goals impossible to predict with any accuracy. The Alaskan Way Viaduct has been a headache for city planners since it was damaged in the 2001 Nisqually quake; scientists believe that the next big earthquake could catastrophically destroy the viaduct. The viaduct’s closest neighbors have reported that their windows have been cracked by “little chunks” falling off the structure. A simulation by the Washington State Department of Transportation shows the viaduct crumbling in a 60 second, 7.0 magnitude earthquake; for comparison, the 2001 quake was 40 seconds with a magnitude of 6.8. In this theoretical quake, the fill soil underneath the viaduct could liquefy, collapsing the nearby seawall, smashing through buried utility pipes, and collapsing the columns that hold up the elevated viaduct. The collapse could also massive blackouts by disrupting electrical lines, leaving half the city without communications or power; fires would erupt as spilled fuel flows out of broken pipelines. The collapse of a similar structure, the Cypress Street Viaduct in Oakland, crushed 43 people in 1989. A group of disaster planning consultants and University of Washington professors have been begging city officials to close the viaduct since at least 2005, citing the dangers of a potential collapse. The Seattle Department of Transportation is already gearing up for the closure with signal-timing changes, assigned traffic cops, and an increase in water-taxi service from West Seattle. Some construction activities with be paused and vehicle parking will be cleared on nearby streets to increase the capacity of those roadways. The city has also been working with rideshare app companies to provide carpooling services. 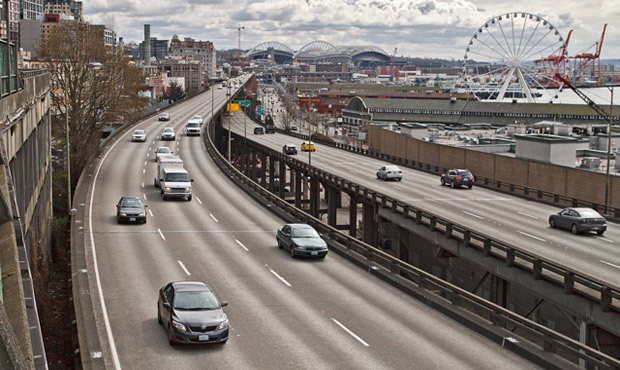 If you are injured in an accident due to increased traffic congestion and confused motorists resulting from the closure of the viaduct, call the auto accident attorneys at Davis Law Group at (206) 727-4000 to request a free legal consultation or to learn more about your legal rights.